Re my 9/23/17 post This analysis may seem to be “academic,” but it has relevance for today’s breeding decisions: AEIs have drifted downward significantly over time, and that means that an older stallion, whose runners ran in earlier years when AEIs were higher, looks better relative to a young sire than he actutally is when measured by AEI. Perhaps the best example of a top young stallion that is better than his numbers seem is Bernardini. A foal of 2003, his runners have run almost exclusively in the modern period when races for top runners are spaced many weeks apart and when top stallions have had a harder time attracting elite mares. It appears the market has figured this out, but he’s better than both his 5% SWs and 1.60 AEI might appear. (An additional factor that depresses Bernardini’s numbers is that his recent crops are large (and from better mares probably) relative to earlier crops. As they mature his numbers are likely to improve further. Comparing AEIs through succeeding generations is very likely more complicated than this column’s analysis suggests. Though changes in race spacing, trainer methods, relative number of graded stakes to foal crop size, stallion book size, and the changing number of foals produced each year explain a substantial part of the downward trend in AEI, there are other causal factors. The use of Lasix may have an effect, though I’d rather not opine on that here. Are Danzig, Northern Dancer, and Bold Ruler better than today’s top sires? I think so, but then again they were once-in-a quarter century type stallions. But if we want to argue their superiority over today’s best stallions we need to adjust the numbers for the differences in opportunities and outcomes across the decades. That requires substantial effort. I will use this website (and possibly other outlets) to continue analyzing cost-effective approaches to breeding and sales. This will include detailed analyses of stallions as I have done before and during each breeding season. If you have suggestions for topics you’d like to see covered drop me an e-mail at RLLosey.com. Watch these pages (especially the 1st and third Sunday of each month) for future posts. Setting logical reserves for yearlings is not easy. I discuss this in more detail in the paper on Auction Markets on this site, but will mention a few common situations. If you buy back a yearling, expect to lose at least 10% (commissions) + prep costs on the resale, and you’ll normally lose much more than this if you try to race the youngster. Yearling pricing is subjective and it’s easy to make a mistake in setting reserves. Dan Rosenberg pointed out to my equine finance class that his consignments were usually within 10% of target when they looked at the average they expected, but that individuals routinely brought 30-50% more or less than expected. You get more traffic than expected and lookers seem to like one of your offerings very much. Should you increase your reserve? The logical answer is probably either “NO” or “Perhaps a little bit.” If you have many lookers who like your yearling, you have a competitive market. In competitive markets you normally get a fair price. Given that none of us really know what a yearling is worth, why make the mistake of buying back a yearling that the market likes now when we don’t know what we’ll have a year from now? You have a first-time graded stakes-winner the weekend before the sale under what had been a blank first dam. Should you scratch and go back in a later sale? If you’re in the Sept. Keeneland sale there is no great later option. Moreover, you will find that there will be a number of lookers who will appear hoping to buy a “bargain,” and that they will often bid prices above “bargain” levels because folks tend to overbid for offerings with very recent positive developments. I’d argue that you should up your reserve and take a run at selling rather than scratch. If the graded SW gets hurt between now and the next sale the upside that buyers associate with buying an offering with current developments disappears. You know something positive that buyers don’t know. Perhaps this colt/filly glides through the fields effortlessly. Do whatever you can to convince potential buyers of hidden positives — a video perhaps. This may be one of those cases where you should (marginally?) increase your reserve, but you still need to buy back a colt at 50-60% of market to make up for the costs you’ll incur on down the line. Perhaps it’s logical to pay a higher percentage for a well-bred filly with hidden talents given the potential residual value. Re “Final Jeopardy” bets. My wife “placed” in Jeopardy in 1995, and I often watch the show with her, responding correctly to about half as many questions as she does. Poor choices for amounts bet in Final Jeopardy are more common than befits the intelligence of the players, but then again general knowledge, and not math skills are what got them on the show. Here is one example of poor betting that is similar to that from a recent show. Players Topper, Midlynn, and Lomam ended up with totals of $15,000, $11,000, and $7,000. Ask yourself how much each should bet if the topic is one that is of average difficulty for each contestant. Topper has to worry only about Midlynn, as Loman can’t catch Topper if Topper bets $0. It’s probably best for Topper to bet enough to outdistance Midlynn even if she bets all her $11,000, which would put Midllynn at $22,000 if she wins. If Topper bets $7,001 and answers the Final Jeopardy question correctly her $22,001 in earnings guarantees a win. What should Midlynn bet? She can’t win if Topper bets correctly and answers correctly, so she should bet enough to outdistance Loman if Loman answers correctly after betting it all ($7,000) and ending up at $14,000. What should Loman bet? Too many folks in third place bet everything, an illogical strategy. Loman should ask where he needs to be to win if the top two bettors answer incorrectly. If Topper bets a logical $7,001 and answers incorrectly, his total will be 7,999. If Midlynn bets $3,0001, she will bet at 7,999 also. With $11,000 to start with, Loman might consider betting nothing. Certainly, Loman does not want to bet an amount that will drop him below $7,999 if he answers incorrectly. Re my co-authored column with Avory Xu of 8/28/17. Avory is drafting a more detailed paper on economic aspects related to the September Keeneland Sale. I’ll edit and perhaps add to it. We’ll get some sort of draft up by the Friday before the sale if at all possible. Re my 7/2/17 column on genetics. Regular readers of my BHD column may recall that in several columns I have provided estimates of the likely distance proclivities of Derby or Belmont horses, or of runners by young stallions. I based my estimates of likely average winning distances (AWDs) on a weighted average of the progeny AWDs of the sire, the damsire, and the sire of the maternal granddam. This assessment does reasonably well. But I have observed that deviations from my predicted AWDs do not follow a normal distribution, which you would expect if distance proclivities are determined by the additive (or multiplicative) effects of multiple genes. Instead, in a significant percentage of the cases, the progeny AWDs of stallions tend to be significantly above or significantly below predicted AWDs. One possible explanation for this is that distance proclivities are determined primarily by one gene. This fits the “speed gene” premise of Dr. Hill and other geneticists. One example of a stallion who produced runners with AWDs significantly divergent from that predicted by his pedigree is A. P. Indy. His sire Seattle Slew’s runners had a 7.7 AWD. His damsire Secretariat also produced runners with an AWD of 7.7. Buckpasser, A P Indy’s maternal granddam sire, predates the era when progeny AWDs started to be calculated, but any reasonable AWD you use for him gets you nowhere close to the 8.2 AWD of A. P. Indy’s runners (which were already higher than they would have been in recent years as fewer distance races have been run in recent decades). And, if A. P. Indy was bred to mares with average distance proclivities, the A. P. Indy progeny AWD of 8.2 represents a number that is pulled down by the distance proclivities of the mares bred to him. If you believe the “speed gene” story, and I do, A. P. Indy was almost certainly a double copy (TT) for stamina. His sire and grandsire were possibly TT stallions, but more likely were CT.
A. P. Indy represented an unusual situation where, if I knew that he was TT before he went to stud, I would have been much more confident than usual that he would be successful. He was a very good 2 yo, and a marvelous 3 yo. TT runners tend to mature late, but his inherent abilities overcame that bias, allowing him to excel against CC and CT runners who had a natural advantage in that they normally matured earlier. His full complement of genes apparently helped him overcome his immaturity bias. A. P. Indy’s dam, Weekend Surprise, was best as a 2 yo. Just considering her racing career, you could argue she could be either CC or CT. But if A. P. Indy is TT, she could not have been CC. An interesting pair of full brothers that support the “speed gene” story are Sadler’s Wells and Fairy King. The AWDs of their progeny are 10.7 and 7.7 respectively. Sadler’s Wells being double copy for stamina and Fairy King being CT is a much more logical explanation from a statistical perspective for these AWDs than that distance proclivities are determined by multiple genes and Sadler’s Wells inherited all the distance-loving genes from his parents and Fairy King inherited all the speed-loving genes. As for Dr. Fager, for whose era progeny AWD is not readily available, I can only guess whether he was CC, CT, or TT, though his MSTN pair could likely be inferred by analyses of his younger runners. For Steve Haskin’s marvelous blog on Dr. Fager, use this link http://cs.bloodhorse.com/blogs/horse-racing-steve-haskin/archive/2013/12/04/dr-fager-where-are-you.aspx. Re pseudoscience, I’ll mention only two of many possible ad hoc breeding theories. 1) A farm rep once “explained” to me that having a prominent relative in the “heartline” of the pedigree was especially beneficial. Oh please — take a genetics course and you’ll learn that genes transmitted from the top, bottom, and middle of the pedigree end up at the same places on the DNA. 2) Doubling up on a prominent runner, or on closely-related prominent runners in the fourth or fifth generation can be “key” to producing a top runner. While there is certainly little or nothing that can be faulted for this approach, there is no statistical study that verifies this practice. A fifth generation relative provides (on average) 1/32 = 3.1255% of the genes in a pedigree. The gene transmission process also means that those fifth generation individuals could end up providing zero or 6.25% of genes of today’s foal (though something close to 3.125% is much more likely). If your goal is to concentrate on getting the best genes possible when constructing breeding, you’ll focus primarily on the near generations. The number of foals produced by the first-year stallions whose runners were rated in the top 25 by earnings increased in total numbers in recent years and, because the foal crop decreased by 35%, ballooned as a percentage of the foal crop. Stallion managers are strongly supporting what they view as the best young stallion prospects with quality mares in good numbers. The fierce competition to “make” these young stallions has resulted in lower numbers for new stallions perceived as of secondary (or tertiary) quality. Do stallion managers always get it right? More often than not yes, but there are occasionally some dramatic exceptions, Into Mischief being the latest marvelous example. And perhaps it should be less of a surprise that B. Wayne Hughes was the man that made Into Mischief. He followed a similar plan more than a decade earlier with Malibu Moon. B. Wayne Hughes at Spendthrift (and the Ashford Stud folks) contribute in a related way to this first-year stallion phenomenon. Ashford has been a wheeler-dealer for many years, but Spendthrift further increased the pricing pressure on first-year stallions first with their “Share the Upside” Program in 2009 then developing the “breed secure” program three years later. Most stallion managers have followed their lead in one way or another because if they don’t, they get outcompeted. Did you notice that four of the twelve Belmont runners were by first-year stallions? Re the 5/28/17 column on the “speed gene.” The three sources I have primarily relied on are discussed below. The most important paper is Dr. Emmeline Hill’s paper (actually there are NINE authors on this paper, but she is listed first, suggesting she contributed more than the other eight authors to the paper). That citation follows here:http://journals.plos.org/plosone/article?id=10.1371/journal.pone.0008645 My background of one genetics course 50+ years ago plus some remedial reading allows me to make sense of most (but certainly not all) of this paper. Even with no background in genetics I suspect you will be able to understand the most important takeaways from the paper. I am searching for a professional geneticist to hold forth on the paper. Stay tuned for that. I suggest reading the summary. Their research finds that the myostatin gene appears to be the most important contributor to the determination of distance preference in racehorses. (Hill et al found the same result.) There is a second, possibly important, locus that seems to contribute to a lesser extent. And there are almost certainly other genes that contribute in modest degrees. The mitochondrial DNA of the dam may also contribute (they do not discuss this) to speed/staying preferences. Look also for Dr. Hill et al’s work on her firm’s business website (Equinome.com). Hill’s research is based on a more extensive data sample from England and/or Ireland than the BB&L paper. Where BB&L compared sprinters vs. stayers, Hill used her bigger sample to include those and a middle-distance group as well. I found the following link especially interesting http://equinome.com/tests/speed-gene-test See the charts at the bottom of the page on distance preferences by gene type (CC, CT, TT). I’d bet dollars to doughnuts that the charts for U.S. racers will entail less spread in distance from the CC to the TT horses. Note that the fact that a horse that has the double copy (CC) speed gene does not necessarily mean (s)he is fast—it just means it tends to be a relatively better sprinter than stayer. Note also that England/Ireland run predominantly on grass, and Eng/Irl tracks card many more distance races than do U.S. tracks. Almost surely the Brits and Irish have selected stallions and mares over the years that have secondary and tertiary genes that contribute to their runners’ greater staying abilities. They also train differently. The result is that their TT runners are probably more adept than our TT runners at running races longer than a mile and a quarter. I did call Hill’N’Dale (Thursday–I should have called sooner) to ask if Maclean’s Music had been tested for the speed gene. The stallion administrator told me she did not know, and that she would inquire of other staff members and they would respond. They have not responded, and perhaps that is understandable, as I am not a shareholder. But, I’d argue that it might be useful if all commercial stallions were tested and the results made known to potential breeders. Wouldn’t it make breeeders’ jobs easier and also allow more effective/efficient decisions? A colleague at the University of Louisville (a Ph.D. who teaches organic chemistry and specializes in molecular genetics) read over the next-to-final draft of my column and made the following comments “…. there may be mutations and variation within the genes which impact trait. Has any snip analysis of the gene been done? Additionally, there may be more then one gene impacting speed if muscle mass, muscle type and behavior (precocious) are impacted. Of course any mistakes that remain in the column are mine, not hers. Horse breeding is not her area of expertise. The researchers have done snip (sometimes called SNP) tests, and they agree with her re possible other contributing genes. That got left on the drawing board when I cut the article (almost) down to my 500 word limit. Re my 5/14/17 Derby Futures Bet column, here are calculations on takeout. The amount bet on the field was $60,335, so each dollar bet on the field is calculated to receive the $134,368 (amount available to bet returned to bettors) divided by $60,335, the amount bet on the (winning) field bet, so $134,368/$60,335 = $2.227. But most tracks round this down to the nearest ten cents, so Churchill kept 2.7 cents in “breakage” per $1.00 bet and only paid $2.20 per $1 bet ($4.40 per $2 ticket). $60,335 bet can be viewed as 60,335 $1 win tickets, each generating 17.5% statutory takeout plus 2.7 cents (.027 dollars) in breakage due to rounding down. .027 dollars x 60,335 = $1,629 in breakage. $1,629 is a hair over 1% of the gross win pool of $162,870, so the breakage is approximately 1%. Takeout is thus 17.5% + 1% = 18.5%. But wait, Churchill Downs has the use of the amount bet in the November pool for almost ½ a year. Unless they are forced to escrow these funds in an account earning no interest, they save themselves borrowing (at say the prime rate of 3.75 to 4% during this time period). A bettor loses the use of this money for almost ½ a year. If the bettor can earn 3.75 to 4% a year (the stock market historically earns more than twice this), the bettor is losing at ½ of this rate each ½ year. Thus the effective takeout is 18.5% (see above) + ½ of 3.75 to 4.00% (let’s round to 2% for simplicity sake), so 20.5% for November bets. Why do I presume that Churchill will generate more race-day handle if they earlier generated more futures bets? I don’t have access to the research Churchill has done on this, but I do observe that when I bet on pick 6 carryovers, I also bet more on WPS and other exotics given that I have already handicapped the card. Seems to me that I also observe that the volume of overall betting goes up on those days as I’m probably doing what a lot of other bettors are doing..
Re my 4/30/17 pre-Derby column on AWD, I see that Sonneteer has drawn in. His calculations are as follows: –>—>—————>—Midnite Lute 7.0 AWD, Half Ours 6.1 AWD, Storm Bird 7.6 AWD, so (4 x 7.0 + 2 x 6.1 + 1 x 7.6)/7 = 6.83 projected AWD for Sonneteer and other runners with these stallions as sire, broodmare sire, and maternal granddam sire. The 6.83 is the lowest of any now projected to be in the Derby. I’m a big fan of Keith Desormeaux. I haven’t run the numbers, but I suspect that he has given his connections more bang for their bucks than 99% of U.S. trainers. I also suspect that having the best 3 yo filly in this race rather than the 20th qualifier would benefit both the racing game and CD’s bottom line. I can’t get the Excel file with which I calculated all the numbers to load on this page, but if you’re interested in seeing the sires, the calculations, and their AWDs pls send me an e-mail at rllosey@gmail.com and I’ll forward it to you. You can see more on the logic of this approach to calculating a runner’s projected AWD by scrolling down in this string to June 5, 2016, when I did a slightly simpler variation of this analysis before last year’s Belmont. Number (or percentage) of stakes winners is one very useful metric, but relying on it alone can push your breeding program in a direction you might not prefer. Consider the three leading first-crop sires from the last fifteen years as evaluated by number of year-one stakes winners. Stravinsky had eight stakes winners (SWs) from his first crop (He’s now doing well down under, where speed on grass is at a premium), Posse had seven SWs, and Successful Appeal had six. Though these three have been useful stallions, shouldn’t we ask ourselves why and whether we would have been perceptive enough to prefer Distorted Humor or Street Cry, leading first-year stallions with “only” five and four SWs respectively. If you buy my premise, you bet on Distorted Humor and Street Cry in light of my research (which you had probably already intuitively figured out) reported in the March 18 Marketwatch section suggesting that leading first-year stallions whose runners exhibit high average winning distances (AWD) have significantly higher probabilities of remaining high on leading sire lists as they mature. On another point, you might have noticed that I calculated progeny earnings based on earnings per foal rather than earnings per runner. As a breeder I’m more int’d in what to expect per foal that I produce rather than per runner. An unsound stallion might produce a high percentage of good runners from the limited number of sound foals he produces, but if his foals don’t get to the track, my mare bred to him is at a disadvantage. I’d be int’d in hearing an argument why I might be wrong on this preference — it will take some convincing to change my mind. I applied a variation on the AWD theme this April Fool’s day that involves stretching the limits of my expertise–In the Ky Derby futures bet I took STATE OF HONOR at 59-1 and PATCH at 11-1 (Had to bet the field to get him). They should like the mile and a quarter distance. Re my column of March 19: The top eleven dual qualifiers in order from the top by AWD are Giant’s Causeway (8.2 AWD), Street Cry, Empire Maker, Kitten’s Joy, Medaglia d’Oro, Bernardini, Curlin, Pulpit, Tiznow, Victory Gallop, and Tapit (7.5 AWD). Of these eleven only Kitten’s Joy and Victory Gallop had yearling averages below $100,000. In the case of outstanding grass stallion Kitten’s Joy I’d argue that his high percentage of grass runners results in lower prices given the bias in favor of dirt sires. At 7.4 AWD are Lookin at Lucky and Pioneerof the Nile, while Quality Road is at 7.2, and Giant Gizmo and Temple City are at 7.1. All of these younger stallions are likely to see their AWD increase as their older runners become an increasing percentage of their total runners. It’s also likely that their percentages of stakes winners will improve as their runners mature. What about War Front? His AWD is 7.3, tying him for 17th highest on the double qualifier list. And though he was a sprinter/miler, his AWD is likely to creep up. For one thing, he had 25 2yo winners last year, pulling his AWD down. And his sire and the sires of his dam line suggest distance (with the exception of Rubiano), with Danzig, Forli, and Round Table being classic influences. Note in the diagram that, though there is a substantial amount of variability in the relationship between AWD and yearling prices, average results show low-AWD stallions having significantly lower yearling prices. There are some low-AWD stallions that sell well, most notably Speightstown and City Zip with AWD = 6.5. But notable though they are, they are exceptions. If you’re looking for bargains, it’s imperative that you analyze more deeply than I have had room to do in my report. I bred to Into Mischief at $10,000 while he was on the way up. In my view the market does not appropriately value stallions with smaller crops. Into Mischief’s small first crop had enough outstanding runners (14% stakes winners from low-CI mares) that the probability that $10,000 very substantially underpriced his potential was extremely high. Do not worry about his reported AWD of only 6.7. Over half of his horses of racing age turned three 80 or so days ago, and those 2yos pull his AWD down substantially. Society’s Chairman’s smaller first crop makes him more risky than Into Mischief was, but he looks very appealing given his demonstrated success. For my Feb. 2017 columns, the following rankings of 80+ stallions by %GSWs (sire power?) both adjusted and unadjusted is available at this link: Ranked by %GSWs short version. Start by favoring stallions with high percentages of adjusted GSWs. Be willing to pay higher stud fees for these stallions, but of course you’ll also want to adjust for other criteria, including the a stallion’s fertility, average winning distance, preferred surface, and more based on your preferences/needs. When looking for foal share deals (a la my 2/19/17 column), reverse the process. Stallions that are overpriced are more likely to foal share in order to fill books. Years ago Cryptoclearance was priced at $50,000. The stallion managers knew that they would get few takers at that price, but were willing to wheel and deal, including doing a boatload of foal share and mare share deals to try to fill his book. There are multiple stallions in 2017 that are overpriced, and most of them are doing foal shares to try to fill books. With a bit of work you can figure it out. Or, if you need help, I’ll be glad to work with you. Over the years I’ve done hundreds of foal share deals. Sometimes you can get marvelous stallions to mares you normally might not expect to book. I’ve bred modest mares on foal shares to Unbridled, El Gran Senor, Cozzene, Lear Fan, Kitten’s Joy, Relaunch, Harlan’s Holiday,and many more. If “sire power” is defined as the quality of a proven stallion, the question remains how to measure stallion quality. The answer is that there are multiple measures of quality that will be weighted differently by different observers, breeders, and buyers. The average earning index (AEI) developed by Joe Estes in the 1950’s was a breakthrough in applying statistical analysis to attempt to measure stallion quality. The ABC indices developed by Bill Oppenheim make useful adjustments that partially mitigate the bias in the AEI that one or a few runners that generate outsize earnings creates. But both the AEI and the Oppenheim approach do little to remove the effects that state-bred programs have regarding increasing runner earnings without a concomitant increase in the inherent quality of runners. In some cases it may be that state-bred incentives result in increased earnings but actually decrease average quality of runners, especially when funds are targeted toward local stallions that are inferior to out-of-state-stallions. I would argue that, especially for commercial stallions, the percentage of graded stakes winners (GSWs) produced provides a substantially better measure of stallion quality than either AEI or Oppenheim’s ABC runners approach. But, merely using the ratio of a stallion’s GSWs to his horses racing age (HRAs) can sometimes generate biased results as well. Most notably, younger stallions are at a disadvantage in generating GSWs because younger stallions typically have more two-year-olds and three-year-olds among their HRAs, and many of those 2yos and 3 yos will not win graded stakes until later in their careers. A sophisticated analysis of stallion quality based on the percentage of GSWs could adjust for the advantage that older stallions have in producing GSWs by analyzing historical records on the percentages of GSWs from two-year-olds, three-year-olds, four-year-olds and so forth, then develop a “normalized” reported percentage of GSWs that accounts for differences in the age distributions of stallions’ runners. Stallions with a disproportionately large number of younger runners would receive “extra credit.” One way to do that is to look at the historical percentage of GSWs of all two-year-olds, and, if for instance that ratio is ¼ as high per two-year-old relative to aged runners, adjust downward the number of two-year-olds included in the HRAs when dividing GSWs by HRAs to generate the reported % of GSWs. If two-year-olds have 1% GSWs while by the time runners end their racing careers they have generated 4% GSWs (both these figures are too high, but I use round numbers for the sake of exposition), then one way to put the two-year-olds on an equal footing is to count only ¼ of the two-year-olds as being part of the HRAs denominator when calculating the GSWs/HRAs percentage. Similar adjustments could be made for 3yos, 4yos, and so forth, to arrive at a “normalized” figure for %GSWs from HRAs that is not biased because a stallion has a disproportionate number of young runners. As an example, Uncle Mo now has 3.1% GSWs from HRAs (including his 2yos of 2017 as HRAs). Tapit has 4.8% GSWs using the same metric. Uncle Mo is at a disadvantage using this approach as a proxy for quality because his oldest runners just turned four. Most of Tapit’s runners are older than four, and thus have had more opportunities to garner GSW status. A sophisticated analysis that compared stallions based on GSWs would adjust the HRAs denominator not only for the number of 2yos a stallion has, but also for each age group. Large adjustments would be needed for 2yos, lesser adjustments for 3yos, and so forth up to the point where there would be no adjustments for the age group where no new GSWs appear (perhaps 7yos?). That adjustment process awaits a time-consuming study that this or another writer might undertake in the future. What I have done is to develop a simpler approximation. It’s obvious that 2yos in January -April do not belong as part of the HRAs denominator when calculating % GSWs—there are no graded stakes for first-quarter-of-the-year 2yos. In fact, dropping 2yos from HRAs completely typically causes no great problems since so few 2yos are GSWs. My approximation phases in counting 3yos as part of HRAs based on the fraction of the year that has been completed. 3yos count for nil in my definition of HRAs on January 1 and count in full on Dec. 31, and proportionally in between. This approach is imperfect, but a significant improvement over the status quo. See a more detailed discussion of this approach by scrolling down from here to the July 24, 2016 column discussion. the Nov. 27 through Dec. 18, 2016 columns on 15-60K stallions: To see numbers/statistics for all stallions, including some stallions and statistics not discussed in weekly columns, go to this file Advantaged Proven Stallions 15 60. In my overall index I have weighted the pipeline and %GSWs numbers equally. Your goals in breeding will cause you to want to weight these numbers differently. If you are looking for a stallion to “make your mare” you will be much more concerned about %GSWs than pipeline. Whatever your goal, you will be concerned about the fertility of stallions. I have made no overt effort to incorporate that consideration. Extremely detail-oriented readers may have noted that the numbers for weanlings by each stallion seem low. I used the figures available through stallionregister.com, which are typically lower than those from the Jockey Club website. But, as I have consistently used the lower figures, the relative rankings of the stallions are (more or less) reasonably represented. If you want to review how I adjust my calculations for percentage of GSWs from horses of racing age to decrease the bias associated with the effects that two and three-year-old runners have on this figure, see the discussion further down on this page re the July 24 column. Kantharos had 9 SWs (including 3 GSWs) from 146 Horses of Racing Age (HRAs) as of Nov. 23, 2016 (He had a tenth SW on Thanksgiving Day.) As 72 of his HRAs are 2 yos, this is a phenomenal record. It’s doubtful he can keep this up, but even if he cools off by 30-40%, he looks very good. Doubters will point out that he is by a mediocre sire and that his runners’ average winning distance (AWD) is only 6.23. There’s plenty of room for argument on this, but perhaps we should give less weight to his sire than usual given Kantharos’ 3 for 3 race record including GIII and GII stakes wins, his very speedy family (four stakes horses from eight runners), and his scintillating start at stud, all of which suggest the possibility that he inherited more than his fair share of his very fast sire’s good genes. Kantharos’ 6.23 AWD is a concern, but, he has two good SWs at a mile and a 1/16th, and he’s been bred to (mostly speedy?) Florida mares. Note also that his largest crop so far is his 2014 crop, and those runners are pulling his AWD down while running those (mostly) sprint 2yo races. Moreover, if you use my method for estimating Kantharos runners’ optimal winning distance, where his sire, broodmare sire, and the sire of his dam are weighted 4:2:1 in the calculations, you arrive at 6.8 based on Lion Heart’s 6.7 AWD, Southern Halo’s 6.8, and Conquistador Cielo’s 7.2. His runners AWD are likely to increase significantly as he has more older runners, though I expect more speed than distance runners. In my view First Sam is underpriced relative to his possibilities. His runners’ AWD is 6.91, surprisingly low to this writer given the distance runners (Lea and Effinex) I associate with him. He has produced 13% 2yo winners, suggesting a nice balance between speed and distance capabilities for his runners. Breed this year and you get a stallion who produces a high percentage of GSWs with the bonus that his pipeline will likely place you in the position that you sell when he has lots of runners on the track that have the potential to make your season purchase look prescient. Midnight Lute has the best pipeline and the third best percentage of SWs relative to his adjusted HRAs of the 11 horses analyzed. Are you surprised that this champion sprinters’ runners have the highest AWD of any of the 11 stallions in his grouping at 7.01? He provides the frame to go long and they often do, and he is one of the most impressive-looking stallions alive. Sky Mesa can throw a nice looker and his numbers are very solid. At 15K he offers good value. Re the 10/30/16 column on stallion book size, this file Pricing_Stallion_Seasons_DiscrimMonopoly&AI pdf is the paper I authored to use in my class on this topic. Perhaps it’s more interesting to academic types who like to see diagrams with cost and demand curves. Re the question of how much big books hurt sales prices because your foal competes with many other foals by the same stallion, I suspect I have a minority viewpoint. I think concern about this effect is overdone, especially if you’re breeding to a popular stallion. If you have a very average Into Mischief or Munnings foal for example, you may feel that buyers will prefer something nicer than yours. but that’s always true, and in my view you’re competing much more against all foals at the sale than against other foals by the same stallion. Won’t buyers look at that average Into Mischief or Munnings foal and say ” this stallion gets runners” and prefer it over most other average (as well as many above average) foals at the sale? Although you occasionally see a buyer who wants to buy a foal by a particular stallion, in which case your primary competitors are other Into Mischief or Munnings foals, in most cases buyers want to buy runners, hence you’re competing moreso against every other foals of similar quality at the sale, rather than those by the same stallion. true-aei-word-table For the 10/09/16 column, the link at the left accesses the table on adjusted AEI. Re the 9/4/16 column on first-year stallions; For a review of the methodology for estimating the potential AWD (average winning distance) of a stallion’s runners see http://i.bloodhorse.com/daily-app/pdfs/BloodHorseDaily-20160605.pdf. After I submitted the column, Saturday’s (9/3) racing stirred the pot, with Union Rags jumping from 9th to 2nd on the list after Union Strike’s victory in the Del Mar Debutante. Her 92 SR places her a point above the SRs of best runners by Dialed In and Creative Cause, though SRs increase dramatically over time for 2 yos as they mature. If the top twelve stallions from the Blood-Horse list are ranked by earnings per runner, Mission Impazible is first with 22K per runner. He could be the real deal, but has the advantage of the NY program earnings. Dialed In is a close second with 21.6K per runner, and Bodemesiter is 3rd with 21.3K. Union Rags jumps to fourth by this metric, after which there is a significant gap to fourth on the list. Re the 8/28/16 discussion of diversification, concentration risk, and risk of ruin. The table and diagram from the Seeking Alpha article is (for good reasons) a standard offering in virtually all investment textbooks. It assumes that you choose stocks randomly. You can get greater diversification by choosing dissimilar stocks, which would marginally lower your risk relative to the reported figures in this article. If you have 30 energy (or tech, or other closely-related) stocks, your risk is higher than represented in the diagram. One of the riskiest strategies an investor can pursue is to invest his/her retirement fund in the stock of the company for which they work. If the company goes bankrupt you lose your job and your retirement funds. There are also “concentration” risks in farm management—you can lower your risk against a calamitous lightning strike by “diversifying” your best foals across different barns or paddocks. The U. S. is on track for approximately 25,000 corporate bankruptcies in 2016. Most will be small companies, but there have been many large ones—General Motors, American Airlines, Enron, Worldcom, Chrysler, and more. There are more types of risk than I have room to cover–fraud (Enron and Worldcom), a rogue trader (Barretts Bank), technological obsolescence (Kodak), international competition (U.S. textile companies, U.S. steel companies), and more, including overconfidence, often by some otherwise very astute investors, including brokers, who think they can stay one step ahead of the market. I have a friend (a smart, thoughtful fellow with an engineering degree) who owns one stock, a stock that increased ten-fold in value from the bottom of the “great recession.” He intends to incur the costs (mainly set-up and research) of diversifying after he takes care of “more pressing” matters. Chances are he’ll be OK, but what he’s doing is comparable to canceling the insurance on his home to save the premium cost. Moreover, the insurance we get from diversification is a bargain because it is almost costless. Add inertia to the sources of risk that can get you in big trouble. Holding your assets in cash and near-cash items greatly diminishes the risk of ruin, but it does pose concentration risk because it exposes you to the risk of inflation diminishing your purchasing power. This column ignores the strategy of breeding to first-year stallions, whose foals tend to sell for a premium relative to foals in later crops. Though this strategy does poorly in terms of racing outcomes and “making your mare,” for market breeders the premium paid for foals by first-year stallions may compensate for these drawbacks. I am not aware of a definitive study on the subject. You may have noticed that Uncle Mo had two new SWs Saturday July 23, 2016 (They are not included in the numbers for this column). He is cranking out SWs at an astounding pace. My colleague Tim Capps pointed out that the last stallion that started out this well might have been Nureyev (who had 10 SWs from 24 first-crop foals). Uncle Mo won’t generate that percentage, but what he’s doing is nevertheless utterly astounding. Can he keep this pace up? Probably not, but if he cools off by half he’ll still be a prolific sire. The following comments address the calculation of SWs as a percentage of horses of racing age. In calculating percentages of SWs in columns 4-6 in the July 24, 2016 column, I always used an adjusted value for HRAs that generates a lower figure than the standard definition of horses of racing age. As per my Blood-Horse Daily column analyses of 10-15K and 20-25K stallions in early 2016, my view is that you get a better picture of a stallion’s ability to throw quality horses by calculating percentages of stakes winners using “mature” runners as the denominator. It’s standard practice to NOT use “total foals” when calculating SW percentages, but rather to use “horses of racing age” (HRAs) as the denominator. Otherwise the SWs percentages would generate distorted comparisons for horses with large crops of weanlings and yearlings relative to the stallion’s older foals. I go a step or more further than not counting weanlings and yearlings by dropping two-year-olds and a fraction of three-year-olds when calculating the HRAs used in the denominator of measures of percentages of SWs. The logic behind this adjustment follows from the observation that the percentage of two-year-old stakes winners is low at approximately 1% of two-year-old crops. Thus the calculated percentages of SWs calculated using total HRAs will typically be pulled down significantly for stallions with large crops of two-year-olds. It’s also useful to make an adjustment for three-year-olds, especially early in the year when they have had little chance to become stakes winners. For the July 24, 2016 column, I adjust the HRA denominator used to calculate percentages of SWs by using (days gone by in the calendar year/365 x number of 3 yos as the number of 3 yos used in the HRA denominator). Using this methodology, only 1/365th of 3yos would be used in the HRA denominator at days-end on Jan. 1, while by the end of the year all 3 yos would be included in the HRA denominator. For this column, because my data was based on figures through 7/16/16, I used 198/366 (it’s a leap year) x no. of 3yos for the no. of 3 yos in the HRA denominator. Using this methodology adjusts for both differences in crop sizes of young and older foals, but also for the time of the year. Adjusting for the time of the year means that you don’t see as much “SWs creep” over the year as young horses make their way into the stakes columns as the year progresses and a stallions’ calculated percentages of SWs increase. I have also subtracted out 2 yo SWs when calculating percentages of SWs on the theory that if I subtracted out 2yos from the denominator, I should subtract out 2 yo SWs from the numerator. Otherwise, a stallion that had a large number of 2 yo SWs would look better than he should because he got a boost in reported SWs from 2 yos, but did not have any 2 yos counted in his HRAs. Though it can be argued that the low numbers of 2 yo SWs will be unlikely to significantly distort reported percentages of SWs, in a small number of cases the distortion will be significant. Forgive me as I have vacillated re the counting of 2 yo SWs among a stallion’s SWs in the numerator of SW percentages, but I now argue that 2 yos should be included in neither numerator nor denominator. Re the July 17, July 10, and July 3 columns on Breeders’ Funds, I’d like to thank Georgeanne Hale, racing secretary at Pimlico/Laurel, Tim Shea, Penn trainer and former president of the Pennsylvania HBPA, and Marshall Gramm, an owner and professor at Rhodes College for their helpful comments when I sent out an earlier draft of the following note. Two overriding goals that racing secretaries seek to achieve are 1) to put together a card of competitive races that 2) contain large fields. If these goals are achieved bettors are more likely to bet, thus generating higher handle. Higher handle translates directly into higher cash flow and profits for the track. The question this note addresses is what, if any, effect that a state breeders’ fund’s payments of owner awards have on field competitiveness. Owners’ awards are typically paid out as bonus payments for running fist, second or third, and are based on a percentage of the purses that an owner’s horse(s) receive. If owner awards are paid for state-bred runners this creates a two-tier purse structure, with state-breds earning higher amounts than non-state-breds that run in the same position in comparable races. Economic theory (and my Pennsylvania trainer) tell us that, other things equal (cet. par. ), a state-bred’s higher earnings potential (because of owner awards) makes it worth more than a comparable quality non-state bred. It follows that in claiming races, a state-bred runner of equal quality to a non-state bred runner is more likely to be claimed because of it’s highe earning potential. But I suspect that owners of state-breds adjust their behavior by running state-breds for higher claiming prices on average than similar-quality non-state breds, and that as a result, a state-bred is not more likely to be claimed than a non-state-bred. H1) State-breds higher values cause their owners and trainers to be more likely run them for higher claiming prices where they are somewhat less competitive than the average non-state-bred. H2-A) If H1 is true, then claiming races at tracks that inter-mingle state-breds and non-state-breds will be less competitive. This will be true because bettors prefer races where the quality of entrants is as similar as possible, and if H1 is true then tracks without state-breds intermingled with non-state-breds will be more likely to have similar quality racers in claiming races. H2-B) This hypo is really a corollary to H2-A. State-b red runners in claiming races will on average have longer odds than non-state-bred runners. This Hypothesis can be tested, and if proven true supports H1 and H2-A. My Pennsylvania trainer tells me that he thinks that claiming races limited to state-breds are easier to win. Though I used to think that this was because state-breds were in general of lower quality, I now am inclined to think that this is because H1 is true. Because of their higher earnings potential, state-breds are more likely to run “over their head” in races where they have lesser chances of winning than their non-state-bred counterparts. But, when a race is limited to state-breds only, this disadvantage disappears. Ms. Hale agreed with my characterization of the goals of a racing secretary, and her view was that state-breds are claimed no more often than non-state-breds. Mr. Shea again reiterated his earlier view that state-breds have higher value because of owner awards. (Losey insertion of his own view: It is useful to note that state-breds probably do NOT have higher values in claiming races to their owners because of breeder awards. Unless the owner is also the breeder, a state-bred earns no more for an owner than a non-state-bred. Moreover, the state-bred will continue to earn breeder awards if it is sold or claimed away from an owner/breeder, hence in general, owner/breeders do NOT run state-breds over their heads because of breeder awards given that they will continue to receive breeder awards if the horse is claimed.) Dr. Gramm cited a case of a PA-bred he claimed in arguing that yes, state-breds receiving owner awards are worth more, and thus this tends to cause owners to protect them with the result that their odds are typically longer than for non-state-bred runners in the same race. Of course the standard disclaimer applies–any mistakes in the above and in the three columns on state breeders’ funds are mine alone. Further Information re the June 5 “Belmont Distances” column. Using Lani as an example, the weighted average AWD I view as approximating the optimal AWD of Lani is calculated as follows. Runners by Tapit, his sire, have an AWD of 7.5. Runners by Lani’s damsire, Sunday Silence, have an AWD of 8.7. Runners by the sire of Lani’s second dam, Sadler’s Wells, have an AWD of 10.7. (7.5 x 1 +8.7 x .5 + 10.7 x .25)/1.75 = 8.3 (The formula divides by 1.75, the sum of the weights, to adjust for the fact that the weights add up to 175%.) Note that we have not accounted for AWDs of generations further back than the sire of Lani’s granddam. The formula we are using assumes, in effect, that the more distant generations’ AWD is the same as the weighted average AWD we have calculated for the three sires for which we have information. Because we are missing only 1/8 (.125) of the AWDs, these estimates are unlikely to be significantly flawed. I consider Lani’s 8.3 to be an overestimate of his distance abilities relative to the rest of the field. While I am unfamiliar with distances typically run by Japanese horses and how stout Japanese mares are, I have little doubt that mares bred to Sadler’s Wells were generally stouter than American mares bred to granddams of the other Belmont runners, and that if Sadler’s Wells had stood in the U.S. his AWD would be less than 10.7. If so, the 8.3 overstates Lani’s optimal racing distance. Nevertheless, even if you substitute 9 for Sadler’s Wells 10.7, Lani ends up with an estimated optimal AWD of 7.9, which is higher than any other Belmont participant. I could not find the AWD of Caro, the sire of Mo Tom’s second dam. I have used 8.0 as my best guess. Using this approach the AWDs of runners out of the first dam’s would have a the most weight in the formula, and, instead of proceeding back through the damsires in the lower half of the pedigree, we would proceed up the “siredams” (the dams of the male line of the pedigree) and weight the AWDs of the runners from the dam of the sire of a Belmont runner by half as much as the dam of the Belmont runner, the AWDs of the runners out of the “greatsiredam” one quarter as much as the runner’s dam, etc. In this fashion we could again generate an estimated optimal AWD for the foal in question that is the mirror image of the approach I used, which analyzed sire, damsire, and great damsire AWDs in the formula. Either approach works equally well if we have reliable estimates of AWDs. But, to my knowledge, there is no database from which we can easily obtain AWDs for the runners out of individual mares. Moreover, there is a “small sample” problem because dams have small numbers of runners, and calculated AWDs will be quite variable and often not reflect the “true AWD” we should expect from a mare . Thus using an approach focusing on dams will have more than its share of statistical problems. Much more information is readily available on stallions than on mares in large part because there are so many fewer stallions and it is easier to generate data on them. Though this exercise has handicapping overtones, that is not my primary motive for developing this methodology. True, taken alone my AWD calculations suggest Exaggerator is at a disadvantage in the Belmont. But, I’d be the last to suggest handicapping this race on the basis of one statistic. Exaggerator may have more inherent ability than any of his competitors and any disadvantage he has due to his relatively low optimal AWD may be overcome by his ability. Cycles Data Re the 4/24/16 column, the attached Excel file provides data and my calculations of “adjusted SWs,” for the five stallions reviewed this week. The file calculates SWs as a percentage of Horses of Racing Age (HRAs), where Graded SWs receive extra weight (double weight for GII and GIII SWs, and quadruple weight for GI SWs), and HRAs do not include 2yos and include only a fraction of 3yos. This approach is a simplification of the approach I explained in MarketWatch earlier this year. It’s probably a bit inferior to the MarketWatch metric, but is significantly easier to calculate while providing similar rankings of stallions. Re the 4/17/16 column on Underappreciated “Value” Stallions. 1) Stand for an advertised price of $10,000 or less. 2) Have average foal crops of 75 or fewer. 3) Have an AEI at least .17 higher than CI. This note, AEI-CI Short Explanation 2016, links to a three-page discussion of my research re the 3/27/16 post on AEI/CI realtionships. If you’re a glutton for punishment, I can send you a draft of the paper itself. The Feb. 10 column on Foal Sharing may give the wrong impression regarding the relative advantages of breed secure-type deals vs. foal sharing. Please see the following original paragraph that is more nuanced. “Foal sharing” and “breed secure” deals are variants of the “pay out of proceeds” idea that allows a breeder to defer breeding fees until the resulting foal is sold. The primary differences are that a typical breed secure deal cedes the first $10,000 or so to the breeder, but never costs more than the stud fee, while a foal share deal has breeder and stallion owner splitting sales proceeds, with 50-60% typically going to the breeder. If you go through the math for a particular stallion, a breed secure deal will almost always benefit the breeder more than a foal share deal. But that comparison is often irrelevant because you normally breed a mare to a higher-priced stallion when foal sharing than when doing a breed secure deal. 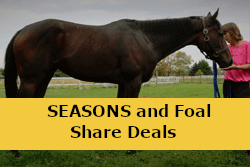 For the same mare, a breeder normally would expect that the sales price for a foal produced from a (higher-priced) stallion via a foal-share deal would sell for more than a foal from a breed-secure deal. Breeders give up more in a foal share deal, but they normally give up more from a larger pot of money produced by the sale of the foal. It’s not obvious that one or the other carefully-researched deal should net more money to a breeder. Filly Facts (Re my Wed. Dec. 9, 2015 Blood-Horse Daily column). A sentence was omitted when the final edit was made that may have made it difficult to understand the equivalence between the no. of foals produced by the “average” mare and the “average” colt. See the sentence in bold below. In 2014 in North America, Thoroughbred yearling colts brought 28% more on average than fillies. At Keeneland 2015, colts traded at a 26% premium over fillies. Why should colts bring substantially more than fillies? An argument often heard is that an outstanding stud colt can produce 150 foals per year, while a mare can only produce one foal. This argument explains why a top colt is worth more than a top filly, but it doesn’t explain the overall premium paid for colts. On average, a colt in any particular crop is likely to sire the same number of foals as the average filly from the same crop. If, for simplicity’s sake, we assume there are 10,000 colts and 10,000 fillies in a crop, with half the females producing a foal each year, then the average female in a crop produces 5,000/10,000 = .5 foals per year. The same applies to the average colt. [i] However, production by colts is highly skewed. 9900 of the colts produce zero foals, with only 100 or so of the colts initially siring foals. In this example, which very roughly approximates reality, 1% of the colts initially have breeding value, while over 50% of the mares have breeding value. It’s not clear which have more total value, the thousands of mares being bred, or the 100 producing stallions. [i] For example, if 9900 of the colts get no chance at stud, they produce zero foals. If the 100 colts that do go to stud produce an average of 50 foals each, they produce 5000 foals (the same number as the fillies produce). The “average” colt from the 10,000 in the crop produces 5000/10,000 = .5. You may say, but what if stallions from another crop breed mares in this crop? Of course that will occur, but if you do the math, the grand averages for fillies and colts from all crops must produce the same average no. of foals as long as there are equal numbers of fillies and colts in the typical crop.